Please note that while Norphans, Inc donates to the charities listed above, we are not limited to making donations only to these organizations. Each year, the Norphans Board of Directors determines the number and amount of grants that will be given for that year. This decision is based on how successful our fundraising efforts were for that year. The entire weekend saw large crowds of Norphans, as well as friends and family members of Norphans, attend one of our three events. Without your support, as well as the hard work by the Norphans’ Board Members Jerry Brindisi ’74, Tom Crossett ’75, Jason Marquess ’67, Mike McBride ‘81 and Mike Ritchie ’84, these type of events would not be possible. On Friday night, at Keenan’s, the Norphans held a “Guest Bartender” event. Serving drinks at this event were Barry Brodzinski ’73, John Doman ’62, Ron Kurtz ’67, Jimmy Lamb ’79, Mark Transue ’81 and Ed Turzansky ‘77. It was estimated that between 400-500 people attended this event, and a good time was had by all. 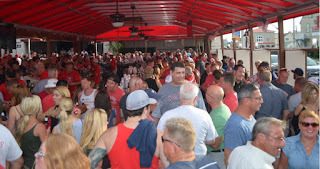 Saturday, during our main event, the Norphan Summer Reunion, over 1,600 people showed up at Keenan’s for no other reason than to get together with some old friends, meet some new friends and raise money for our charities. A special thanks to Fox 29’s Bob Kelly ’81 and UFC Lightweight Champ, Eddie Alvarez ’01, for appearing at the reunion and keeping the crowd in a great mood throughout the day. The Norphans would also like to thank Scott Keenan and his staff at Keenan’s Irish Pub of North Wildwood for all of their hard work. In addition to these folks and the Norphan Board members who produced this event, we would not have been able to pull it off without the hard work of the following people: Pat Bethel ‘81, Karen Creedon, Cailean Crossett, John Levy ‘92, Dennis McDonough ‘76, Max McGettigan ‘82, Butchy Oakes ‘73, Tom Oakes ‘76, Mike Primavera ’96 and Harry Smith ‘81. For Sunday, with only a couple of days’ lead time, John Barnes ’90, leaped into action to pull together the Inaugural Mass on the Beach. In short order, John secured Father John Kelly ’70 to celebrate the mass, which was concelebrated by Father Joe Campellone. John was even able to provide two singers, Steve Duzinski ’67 and Timmy Kelly, as well as a guitarist, Wesley Oaks. The site was secured on short notice thanks to Anne Devlin from the North Wildwood Rec Center, and the North Wildwood Mayor’s. Norphans, Inc., is a 501(c)(3) tax exempt organization, which means when you make a donation to this organization, a portion of your donation may tax deductible – please check with your accountant for details. Norphans, Inc. is NOT AFFILIATED WITH any other North Catholic group or association, including but not limited to the Northeast Catholic Alumni Association, Inc., the North Catholic Soccer Alumni, Inc. or any other group with Northeast Catholic in its name. Every dollar raised by Norphans, Inc. goes directly to the financial grants and the charities listed above. You can see past grants on the “Our Donations” page of this site. Each and every Norphan board member, as well as Norphan volunteers, provide their time and efforts with no compensation. It’s purely a labor of love for these fine men, and truly a sacrifice for their families. Parents complete an application, which can be obtained from any of the Archdiocesan high schools or by requesting one by emailing us at Norphans@outlook.com. Completed applications are returned to the president of your child’s school. The presidents of the school will determine the financial need of the student and provide a list of names, ranked in financial need order, to the Norphans Board. The Norphans Board determines how many students receive awards and how much each grant will be. Again, thank you for your continued support of the organization and commitment to Catholic education. We look forward to seeing you all for the 6th annual reunion weekend of July 29, 2017.